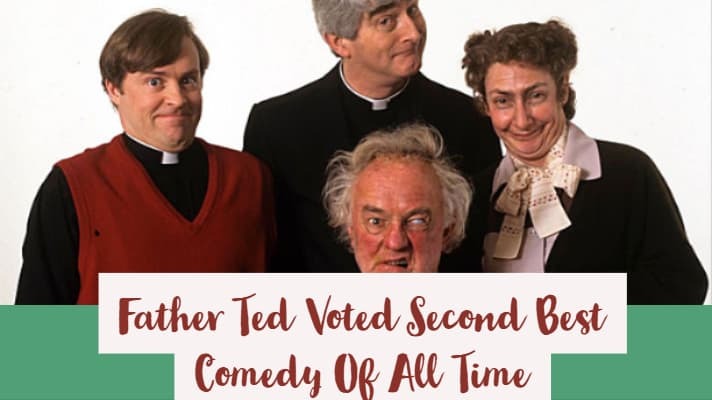 I was very happy to see that Father Ted is voted second best comedy of all time! It has to be one of my favourite Irish series ever! If it has been a few years since you watched it then do yourself a favour and download the three series. I did this about six months ago and was amazed just how many scenes I had forgotten. Even some ten years later(the series aired on RTE from 1995-1998) the series is still relevant and extremely enjoyable. If you are yet to watch this series you have no idea what you are missing! Fun fact my uncle starred in two episodes of Father Ted! You can find a lot of these episodes on YouTube, and below I have included my all-time favourite episode “A Song for Europe” | Father Ted | Series 2 Episode 5. Okay without getting too sidetracked you are probably wondering about the headline! New research conducted by Radio Times Magazine, Father Ted is the second best TV sitcom of all time. You can see below where Father Ted is voted second best comedy out of 10 other arguably great shows. Fawlty Towers claimed the No. 1 spot, even though it only ran for two series. If you have no clue about Father Ted it is set on the fictional Craggy Island, a remote location off Ireland’s west coast, the show starred Dermot Morgan as the eponymous Father Ted Crilly, alongside fellow priests Father Dougal McGuire (Ardal O’Hanlon) and Father Jack Hackett (Frank Kelly). Describing it in any more detail would be very hard, one of those shows you have to watch! If you enjoyed this post check out these 15 images you will only find funny if you are Irish. P.S Grab your weekly dose of Irish straight to your inbox every Friday!